We have gained vast experience in offering unmatched range of Highway Construction Equipment to our clients. Our range is also available in different specifications that meet the individual requirement of our clients. 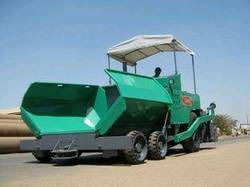 Apart from this, we also offer mobile asphalt plant / mobile wet mix plant, road construction process, road construction machines and construction machines to our clients as per their requirement. Looking for Highway Construction Equipment ?